Welcome to the full-text digital archive of the Carnegie Institue of Technology Faculty Bulletins, 1916-1971. What happens at a University besides classes? What do faculty do beyond teaching? The Faculty Bulletin of The Carnegie Technical Institute helps answer these questions by outlining, on a week by week basis, what various faculty were doing both professionally and personally. 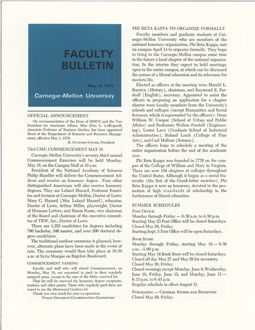 The Faculty Bulletins provide snapshots of the lectures, classes, research, programs, clubs, demonstrations, parties and policies of any given moment in the early and mid history of Carnegie Mellon University. Digitizing the Faculty Bulletin has made it possible to trace the activities and careers of the faculty of the university in ways that the unindexed hardcopy originals can not. Providing full-text searching of primary documentation of the University's Faculty will illuminate the impact of their work, both professional and personal, on the university community specifically and the Pittsburgh community at large.